The Denver Broncos won’t be able to hire Vance Joseph as their new defensive coordinator. The Cincinnati Bengals will not allow Joseph to leave his position as their secondary coach, a source told FOX Sports Tuesday night. Bengals owner Mike Brown and Joseph are both scouting college prospects at the college all-star game in Mobile, Ala.
Joseph, 42, interviewed last Friday for Denver’s head coaching vacancy that opened when John Fox left the team earlier this month. But with Gary Kubiak already considered a lock for the position, the meeting with Joseph proved just as valuable in giving Broncos management a glimpse into what Denver would be getting if he were hired as defensive coordinator. CBS Sports first reported last week that Joseph would be Denver’s top choice for defensive coordinator if Kubiak were hired. 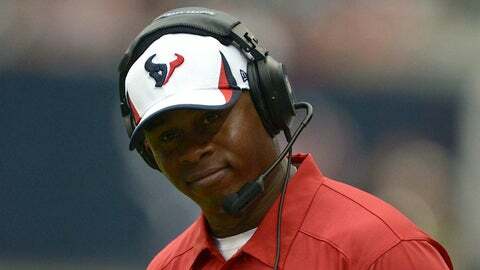 Joseph was Houston’s secondary coach from 2011 to 2013, when Kubiak was the team’s head coach. Joseph served as San Francisco’s secondary coach from 2006 to 2010. Kubiak was officially hired Monday by the Broncos. It isn’t uncommon for a team to block an assistant from accepting a coordinator job elsewhere, even when a promotion is involved. Some franchises value staff continuity and don’t want to lose a quality position coach, as the Bengals would be doing with Joseph. In 2011, the Bengals blocked then-defensive backs coach Kevin Coyle from interviewing to become Philadelphia’s defensive coordinator. Coyle was allowed to leave the following season for the defensive coordinator position in Miami that he continues to hold. Cincinnati tied for the NFL’s third-highest interception total this season with 20. The Bengals ranked 13th overall in pass defense despite finishing with a league-low 20 sacks.